Garry Winogrand, 1964: National Gallery of Art, Washington D.C. While bands, dancers and floats filled with people dressed in traditional German clothing marched up 5th Avenue as part of New York City’s German-American Steuben Parade on Saturday, I ducked inside the Metropolitan Museum of New York and spent a few minutes in the Garry Winogrand photography retrospective. Winogrand’s best images document daily life in New York and elsewhere during the 1950s through the early 1980s and include some shots taken at airports. Standing before the picture below, taken by Winogrand at JFK International Airport in 1968, I listened to a dad explain to his kids what phone booths were. “You had to go into this little box and put a nickel or dime into little holes above the phone before you could call anyone if you weren’t at home,” he said. 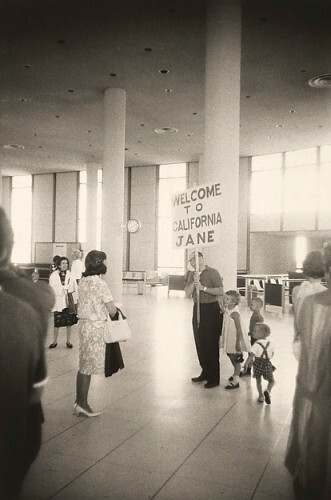 Winogrand’s photograph at the top of this post, taken at Los Angeles International Airport in 1964, is my favorite. Wish we knew the story that went along with that big sign. Garry Winogrand, 1968. Collection of John and Lisa Pritzker. From the Gary Winogrand retrospective at the Metropolitan Museum of Art. A new photography exhibit by pilot, geoloist and artist Evan Anderman is on display at Denver International Airport. Anderman’s selections for the exhibition, called “Imposition,” explore land use in Colorado’s Eastern Plains through images take from his airplane’s cockpit. “Contour Intersections,” below, “shows the intersecting patterns that are created on four different fields from the contouring that is promoted by the Soil Conservation Service to prevent erosion,” said Anderman. You’ll find these photos and others in the DIA Airport Office Building lobby gallery through March 2015. That area is accessible pre-security near the A-Bridge security checkpoint on Level 6, north of Jeppesen Terminal weekdays from 6 a.m. to 6 p.m.
All photos courtesy Evan Anderman. A wonderful exhibition of 20 kitschy black & white underwater prints from the 1940s and 1950s is on view at Miami International Airport (MIA) by Gate D31. The images are by photographer Bruce Mozert, whose keen eye and whimsical photos helped document and promote Florida’s tourist destinations, especially Silver Springs, an aquatic attraction with glass bottom boats. The attraction is now Silver Springs State Park and the glass bottom boats are still there. You probably won’t see beautiful girls talking on underwater telephones, but the park promises that you’ll see unusual formations, ancient artifacts and movie props from some early underwater films made for Hollywood. As a Seattle gal, I’m no longer impressed – or alarmed – to find a Starbucks on every corner and in many area groceries, hardware stores and banks. But I am amused that Helsinki Airport is crowing about the fact that Finland’s first Starbucks coffee shop has opened up at the airport. I’m far more interested in the airport’s art activities, which include a fashion gallery, a photo gallery and a design gallery. Right now, the Design Gallery is exhibiting a variety of chairs created by Finnish designers. The chairs aren’t just for show: passengers are allowed to sit down and enjoy “a unique moment of Finnish design and restfulness.” There are even headphones available to block out the noise of the airport. And, over in the airport’s Fashion Gallery, there’s a catwalk where passengers can show off their travel outfits. Heading to Helsinki? The Design Gallery is Gate 11, the Art Gallery by gates 16–17, the Photo Gallery is above gate 26 and the Fashion Gallery at Gate 31. Lost a camera while traveling? Don’t lose hope. Here’s a heartwarming story I had the pleasure of tracking down for msnbc.com’s Overhead Bin. Tom Hansen, left, with his wife, Yvonne, and friends Jan & Ron Stan at a site in Athens, Greece, where he picked up the lost camera memory card. During a European cruise this fall, Tom Hansen and his wife, Yvonne, spent a port day visiting historic sites in Athens, Greece. While having their picture taken on a hillside with a view of the Acropolis, Hansen spotted a camera memory card on the ground. When Hansen returned home to Bellevue, Wash., at the end of October, he loaded the memory card onto his computer and began looking through the 550 mystery pictures. The most recent shots showed an unknown couple in Athens and on various Greek islands. Earlier pictures showed the couple in various cities, at family gatherings and playing with a baby that looked to be a new grandchild. By studying the pictures, Hansen concluded that they documented about a year-and-a-half of milestones in someone’s life. “I decided I wanted to find these people and get the memory card back in their hands,” he said. He studied the photos for clues. One shot showed the names of two female tennis players on a scoreboard with what looked to Hansen like English countryside in the background. Hansen pulled up the Wimbledon website and discovered that the women had indeed played there, so he figured the mystery couple had been to Wimbledon. Maybe they lived in England. Hansen placed an online ad on craigslist in London. He also posted notices containing several photos from the memory card on websites devoted to reuniting people with lost cameras. One of the mystery photos showed a man in a classroom being awarded a plaque and a gift bag. On the wall were these partial words: ‘tute,’ ‘pool’ and ‘us.’ Hansen tried matching the letters to school-related words and came up with “institute” and “Liverpool,” then pondered banners in the room bearing Chinese characters. So Hansen called the institute and got Sandra Sheridan on the phone. Knight was not an employee of school, but he was a consultant whose retirement party had been held there a year earlier. A colleague from the university contacted Knight to let him know that someone named Tom Hansen in America had found the memory card and was trying to return it. As it turns out, Knight and his wife, Annette, who live in Formby, England, had actually been on the same cruise ship as the Hansens. Both couples had visited the same hillside to get a view of the Acropolis. Matt Preprost, founder of IFoundYourCamera.net, said that while the number of photos from found cameras and memory cards varies from week to week, since 2008 his website has been visited close to 7 million times. The site has reunited dozens of lost cameras with their owners. Knight and Hansen haven’t talked on the phone yet, but Hansen feels he’s gotten to know the Knights – and what they’ve been up to for the past year-and-a-half – by studying their photos. In an e-mail, Knight has offered a cash reward to Hansen for his troubles.